With a variety of configurations coming from your patty former, you need a flexible solution to match patty sizes and your lane layouts. The Pacproinc® PPI-200 line of interleavers accurately and consistently places a pre-programmed sheet of paper, film, or foil under or around your product at speeds up to 600 pieces per minute. The PPI-200 is ideal for interleaving scored patties, whether you select the single-lane configuration, purchase the alignment device for multi-lane setups, or choose a complete single-lane system for interleaving/stacking/tray loading. Interleaved (underleaved) products can be conveyed to one of our modular auto stackers for hands-free counting and auto stacking before introduction to your packaging or wrapping machine. Gain additional line flexibility with our bypass option. This option is available to accommodate processing of non-interleaved or non-stacked product and allows these products to be introduced to the packaging machine without having to take the interleaver or stacker out of the line. Pacproinc®‘s 19″ wide interleaver introduces paper under hamburger patties in multiple lanes for the purpose of freeze release. Pacproinc® corrects leading-edge misalignment in multi-lane operations by straightening fresh or frozen food products into neat, even rows for consistent interleaving. Pacproinc®’s layer pack line will accept product from any slicer or former, group the product flow, interleave with a single sheet of paper or film, and create a final stack that can be fed to a wrapping machine or other packaging equipment to eliminate multi-station layer packing. The PPI-200 VERSA-STAX stacker can also interleave, stack, and tray load at speeds up to 300 portions per minute. Designed specifically for single-lane, homestyle patty formers, it can be used in conjunction with an automatic tray de-nester or as a standalone stacker, and product can be stacked with or without paper. Adding a PPI-200 Interleaver to your line will provide the automatic placement of paper under each portion, and the VERSA-STAX features programmable stack counts and tray loading configurations, as well as a loading feature for various tray sizes. 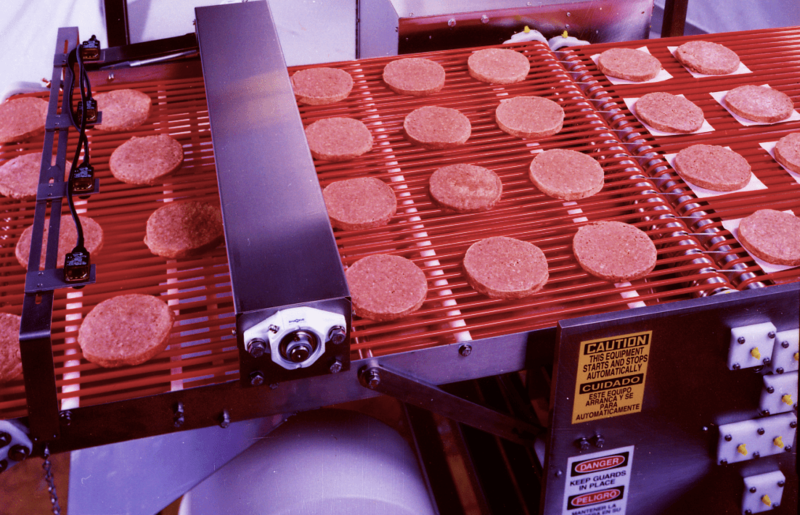 This Pacproinc® solution automates the counting and stacking of formed or sliced burgers. Coupled with a Grouper and/or an Interleaver this solution is capable of automatically generating a finished layer pack. Interleave, Count, Stack, and Tray Load burger patties at speeds up to 100 burgers per minute. When used in conjunction with an automatic tray denester and tray-loading module, it eliminates the need to manually interleave and package case-ready patties.